Art Winnie and his brother Bert ran a barber shop on Front Street in Traverse City, Michigan back in the early 1900's. They were both avid sportsmen so it's only logical that the barber shop bustled with hunters and fishermen. Both Art and Bert not only cut hair in the shop but also used it as an outlet to ply their trade as fly tiers and lure makers. 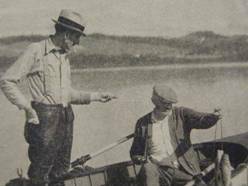 Art Winnie, in the early 1920's, developed a famous fly called 'Winnie's Michigan Caddis,' aka, 'Michigan Caddis' or 'Winnie's Fore-And-Aft.' Later, in the early 1940's, he developed another famous fly the, 'Michigan Hopper.' 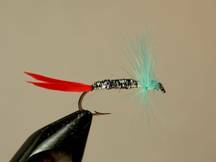 Over the next decade the fly would undergo many changes and was so popularized by a man named Joe Brooks that the fly eventually took his name and is now called 'Joe's Hopper.' 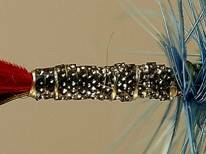 This pattern is one of the most popular grasshopper patterns in the country. Another famous pattern created by Art Winnie was known as the 'Victory Fly.' This was a fly never intended to be taken seriously as a fishing pattern but rather one designed as a symbol of American patriotism. Art designed the fly between 1941 and 1945. In the opinion of this author, it was probably designed shortly after we declared war on the Japanese which would place it's creation in late 1941 or early in 1942. 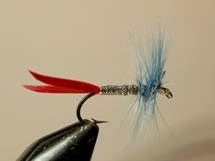 The 'Victory Fly' incorporated red white and blue colors and was, not only, tied on standard hooks but on pins as well, allowing people to wear it as a broach or lapel pin. President Franklin D. Roosevelt is said to have worn one of Art's 'Victory Flies' on his lapel on more then one occasion. enlargement of the body section so that you can examine it more closely. The best I can come up with is that it was a ribbon like material that was probably available at a dry goods or millinery store. twisted together then wrapped forward. The original fly was in poor condition. Whether it was tied poorly from the beginning or damaged over the years because of handling or poor storage, it's hard to say. 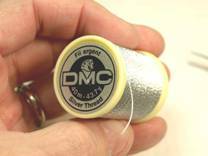 The thread color of the head is not discernable. The only head appearing is a large irregular glop of head cement. My imitation was tied with black thread, which is what the 'old tiers' used but in keeping with the spirit of the fly he may have used a red, white or blue thread. This pattern was long thought to have disappeared to the annals of history until one was recently discovered in a private collection of Art Winnie's flies.